A lawyer and Tennessee State Senator at the outbreak of the Civil War. He voted against secession, but went with his state when it seceded (Though his father was a Union supporter). He was commissioned as Colonel of the 31st Tennessee Regiment. The 31st Regiment was organized in March, 1862 as the 39th Infantry Regiment and contained 363 effectives in April, 1862. It's members were from the Tennessee counties of Sevier, Blount, Jefferson, Hawkins, McMinn, Greene, and Monroe. The regiment was attached to the brigade of A.W. Reynolds in the Department of Mississippi and East Louisiana. A detachment of the 39th captured the Federal gun boats Queen of the West and Indianola, and later the regiment spent forty-seven days in the trenches of Vicksburg where it was captured on July 4, 1863. After being exchanged and reorganized as mounted infantry, it was assigned to General Vaughn's Brigade. The unit contained 272 effectives in April, 1864, moved to the Valley of Virginia, and lost forty-one percent of the 118 engaged at Piedmont. Later it participated in various engagements and surrendered at Asheville, North Carolina on April 26, 1865. Colonel Bradford's commission as Brigadier General was on the way, but did not reach him until after the surrender. He was one of Confederate President Jefferson Davis's escorts when he was captured in Georgia. His property was confiscated at Dandridge, Tennessee and he moved to Athens, Tennessee where he was the junior partner in the law firm of Blizard and Raford. After the death of Senator Johnson, Judge D.M. Key, being appointed U.S. 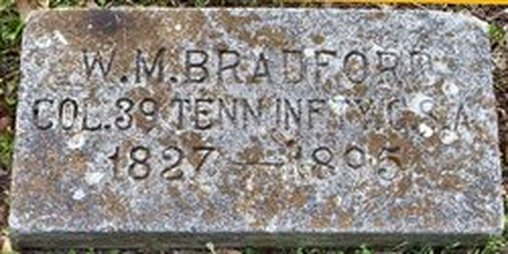 Senator, William M. Bradford was appointed by Governor Porter as Chancellor to fill out the unexpired term and was twice elected to the same office by the people, which he occupied for many years until his health failed. He moved from Athens, Tennessee to Chattanooga, Tennessee in 1880 and passed away in 1895. Copyright © 2015 - 2019 Col. W.M. Bradford & Col. J.G. Rose #1638, SCV, Morristown/Mossy Creek, Tennessee U.S.A.